Whether it's teaching Purdue's agriculture students more effective research techniques or studying graduate students' data literacy needs, Marianne Stowell Bracke is dedicated to helping others learn. 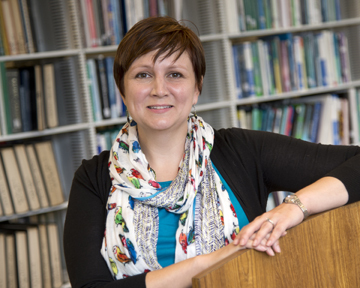 Bracke is an agricultural sciences information specialist and associate professor of library science. In addition to fostering undergraduate students' information literacy -- the ability to find, use and critically evaluate information -- she seeks to help graduate students and researchers find, access, manage, preserve, and, in some cases, share data. How do you help students become more effective researchers? Along with Marcos Fernandez, associate dean for agriculture and director of academic programming, I teach two classes: AGR 101, which is an introductory course all agriculture students must take, and AGR 294, which is a reading and discussion seminar. In AGR 101, I teach students some basic academic techniques, such as how to recognize and evaluate different types of information, including the differences between peer-reviewed articles and material they might find on the Web. In AGR 294, we choose a different book each semester and use it to teach students critical thinking and reasoning, critical discourse and information evaluation, which are all 21st-century skills. In what ways have you developed your teaching skills? Last academic year, I received the University Faculty Fellowship to Study in a Second Discipline. I spent the year taking research classes and working with the Youth Development and Agricultural Education Department, and it really broadened my ability to teach and do research. It's reinvigorated how I think about students. After 16 years on the other side of the desk, it helped me remember what it's like to be a student and how overwhelming it can be to learn the research process for the first time. What professional projects are you working on outside of your teaching? I'm working on several ongoing projects. One involves the Purdue University Research Repository (PURR), which provides an online, collaborative working space and data-sharing platform for Purdue researchers. Specifically, I'm working to make agronomy-related data public via PURR. That data came from publicly funded research, and the researchers frequently get requests to share the data. I'm working to deposit the data into PURR from the water-quality field station, for example, that contains information going back to the 1980s. It raises the profile of the data, which results in more use and increased citations for the researchers. What other research are you involved with? Along with several colleagues at other universities, I'm looking at researchers' and their graduate students’ data literacy needs. Essentially, we want to know how we can help researchers describe, curate, save and share the data they use and produce and pass these skills on to the students in their labs. This project has been ongoing for two years and ends this fall, so we're getting a good idea of how we can help researchers in this area. Another related project is one we're just getting off the ground. Along with Purdue colleague Jake Carlson, we’ll begin to address the data literacy needs of some of our agriculture graduate students. We will be recruiting a small cohort of grad students to work with closely for a year. We'll teach them to be better users and creators of data while creating a community of learning. We foresee these students taking the skills back to their labs and sharing what they’ve learned. How do you hope your work will help graduate students and researchers? In the project that involves graduate students, I see an opportunity to make Purdue's graduate students stand out from students at other universities. If we can teach them data literacy skills that other graduate students don't have, their quality as researchers and professionals will immediately increase. When it comes to researchers, we hope to help them bridge the gap between doing their work and dealing with the data they use and produce. Data needs can be a big impediment for researchers, and the academic community at large is still searching for the best solutions. I hope that our research projects will be a big step toward that goal. If we can help researchers with data, we can help them find and use the best data solutions. That would be great for everyone.